This book is a comprehensive political history of England from the early 12th to the end of the 14th century. Jones opens with the wreck of the White Ship and closes with the deposition of Richard II, and in-between, he charts the evolution of the English monarchy, the rise of the cults of St.s George and Edward the Confessor, and the ebb and flow of English fortunes in French territory. While Plantagenet history is something I’m more than passingly familiar with already, I was happy to get a really solid look at some reigns that don’t always warrant a lot of historical attention — John (apart from Magna Carta), Henry III, Edward I. Jones also provides some anecdotes and small details which flesh out the broad strokes. My favorite had to do with the sinking of the White Ship, and how the heir to the throne would’ve been safely away — had he not gone back to rescue his sister, which led to his lifeboat being overwhelmed by other drowning victims. Jones does an excellent job of chaining cause and effect together, even when those things are complex, balancing the demands of family and feudalism. Jones relies on a lot of primary sources, though he writes in such a way as to keep them from becoming too dense — those who fear footnotes will not need to cringe at this text. Instead, he offers a bibliography of suggested further reading at the end of the book, and most of those sources date from 2000 and forward. Jones does a nice job of contextualizing the relationship between the king and the barons and how it changes over time, as well as the complex network of ever-shifting alliances on the continent. Reading this book, you do get the sense — as I always felt about Tudor-era politics — that really everyone was out to screw England all the time. No one can seem to hold an alliance for more than twenty minutes. Similarly, the English don’t seem to be able to keep control over the Welsh, Scottish, and Irish any longer than that. What’s particularly fascinating from my point of view is seeing the aristocracy take shape underneath the king’s rule. As someone who loves family trees, it’s fun to see when different families wax and wane, particularly once it starts getting into the 14th century and the names become those more recognizable to those of us familiar with Shakespeare’s history plays and with Tudor history — de Bohun, de Vere, Howard, Dudley, Neville, Montagu. In so doing, you also see the entire country become more thoroughly English. Slowly, the Norman and Aquitanian influence bleeds out and the nobility comes from England’s own magnates. There were, though, ways in which the book was disappointing. For something subtitled The Warrior Kings and Queens Who Made England, there’s precious little on those queens. This is, still, a male history. Queen Matilda and Eleanor of Aquitaine get a little attention, but nothing compared to their men — and really not much to personalize them. Their deeds are mentioned, not themselves. Joan of Kent, somewhat scandalous wife of the Black Prince, is little more than a tabloid feature. As for the other women crucial to the Plantagenet line, all those wives and daughters and sisters — Phillippa of Hainault, Eleanor of Provence, Isabel the She-Wolf of France, Eleanor of Castile, Princess Joan, Princess Isabella — hardly get any attention but for how they affect the reigning king. Once they’re married out or pensioned off, and thus “off-stage”, as it were, they cease to exist. And it’s such a shame, because they have stories in their own rights. They had will and agency. So many of them defied type, or redefined it. Jones does them a discredit, I think, by relegating them only to the reactionary status women have so typically occupied in histories. Based on the book’s title, I was really hoping for much more. (Jones also goes out of his way to dismiss any whisper of homosexuality or bisexuality as attached to the English crown; I’ll give him that claims about Richard I and II still generate a lot of disagreement, but Edward II? Aren’t we pretty sure about that? Yet Jones waves it all off with no examination whatsoever). It also ends rather strangely. This book covers up to Richard II’s 1399 deposition, and Jones tries rather hard to make this a conscious stylistic choice, rather than an awareness that going on through the rise of the Tudors would produce an 1100-page book. Except that it rings false. 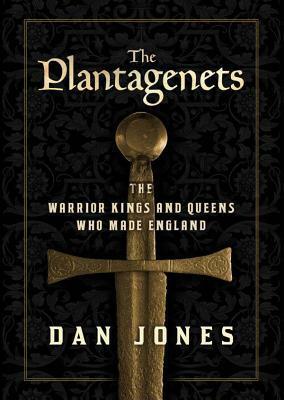 While the essence of kingship may change after Richard II’s fall, Jones simultaneously tries to claim that his ascension somehow breaks the line of Plantagenet kings — which is ridiculous. Henry Bolingbroke had every drop as much Plantagenet blood in him as Richard. They were both sons of Edward III’s sons. First cousins. Jones even points out that Henry was Richard’s closest heir in the male line. So it’s a bit hard to claim that the blood line was broken, any more than it was when King John succeeded Richard I. So, on the whole, this is an easily digestible compendium, and I could recommend it as a good starting point to someone with no real familiarity with the era. Someone with more background in England’s medieval history might not find much new here, though, and if you’re looking for something incisive that treads new ground, this isn’t it. Jones compiles a rather unchallenging view of English history in a simple presentation — perhaps too simple, really.